Available December 2019 from University of Alabama Press. Cover photo by Jim Godwin. Red-cockaded woodpecker management, Sehoy and Enon plantations, Alabama. Installed 52 Red-cockaded Woodpecker artificial cavities on the Osceola National Forest, March 20-15, 2016. This document, available through NWF here, was prepared by Mark Bailey in 2015. Turtles of Alabama now available, co-authored by Mark Bailey of Conservation Southeast. Published October 2015. In 2014 and 2015 Conservation Southeast worked with ADCNR, Terwilliger Consulting, and partners to develop Alabama's State Wildlife Action Plan for 2015-25. The entire SWAP (July 2015 draft) is available here. On January 2, 2018 the Black Warrior Waterdog, Necturus alabamensis, an Alabama endemic,was listed as Endangered by the US Fish and Wildlife Service. Mark Bailey of Conservation Southeast Inc. has over 25 years' experience working with this species and is federally permitted to conduct surveys. In December 2015 Congress made permanent the enhanced tax deduction for conservation easements. We work with the Alabama Forest Resources Center and other easement holders in conducting baselines and annual monitoring of conservation easements. "Many people making a living off of the land are often land rich but cash poor, meaning they make much less from farming, ranching, or forestry than the land on which they do it is actually worth. This wealth discrepancy can pressure landowners to sell to developers, a pressure which the enhanced deduction is designed to alleviate." 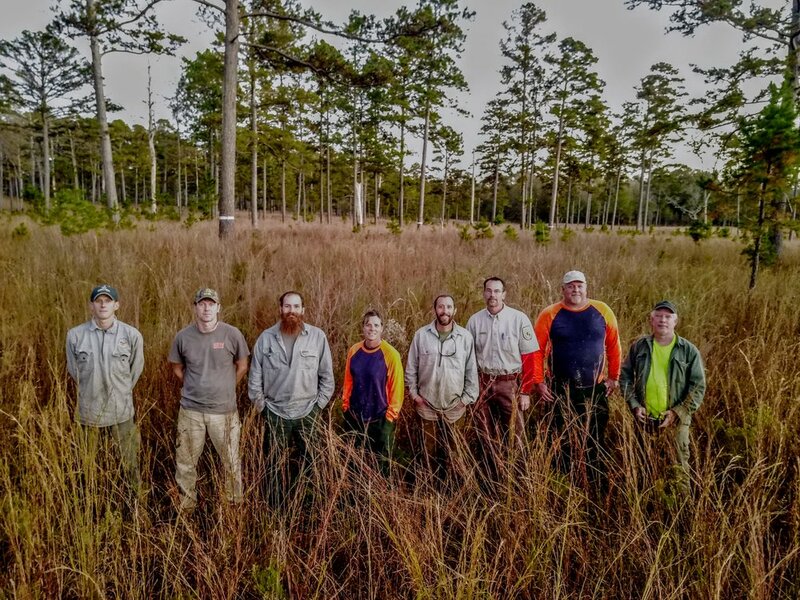 December 2017: Mark Bailey of Conservation Southeast (left above, right below) and Eric Spadgenske of USFWS (3rd from right) with the crew of U.S. Forest Service biologists who installed 48 artificial cavities to maintain nesting and roosting habitat for the red-cockaded woodpecker at Sehoy and Enon plantations in Bullock County, AL. We had USFS folks from four Ranger DIstricts. From 2007 to 2017 this RCW population expanded from 4 to 32 groups, fledging over 50 young in 2017.